Two long days of driving brought us from Prague back to Amsterdam, where we camped for one night while we did laundry, packed and winterized Rover. 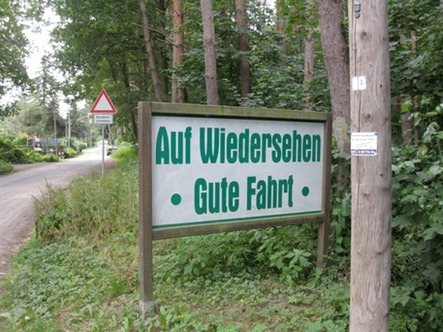 On our trip there, we had seen an RV store from the autobahn and taken the next exit to get to it (it was only about 100 feet ahead). There we found--wait for it--antifreeze!--for our drinking water plumbing system!--two containers of 2.5 litres each, barely enough to do the job, even after we’d added a bottle of wine. But we were thrilled to find it, even at $58 for the two. European motorhome owners usually just drain their plumbing systems when winterizing, so antifreeze (nontoxic) is nearly impossible to find. We had called ahead to the storage place we had used in Amsterdam on some earlier trips, and we were recognized and welcomed back. Storage costs have increased to € 90 a month, so we gave him $1075 to see us through next April . . . and then we headed to the airport. Our Born Free, Rover, performed flawlessly, but she needs a good bath. Her AGM Freedom batteries sit in the dark and cold for nine months, and awaken every spring when we return. We do not have a generator to deal with--they are not allowed in European campgrounds--and the step-down transformer and inverter/charger at the heart of our electrical system continue to perform well, while our LP gas supply never seems to run out. We never added LP gas, even though it is available at nearly every gas station except in Denmark. 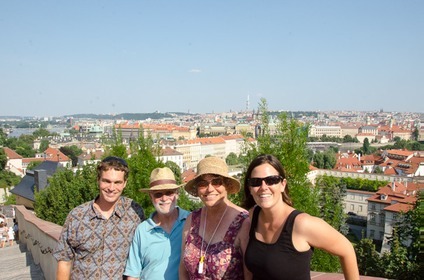 This year our shortened trip was 2111 miles--25% of that during the last two days, getting from Prague to Amsterdam. We spent $1702 for 208 gallons of gasoline, leaving Rover with a full tank for storage. The gas this year averaged $8.19 / gallon: the mathematical savants among our readers will have already recognized this as 10+ mpg and $ .80 / mile. We were on the road for 32 days. We paid for a campground every night and, since it was high season, did so at higher rates, an average of $41/day. In total, we paid $1332 for campgrounds, showers and electricity: we have included showers and electricity in the campground cost because we always used them. Sometimes showers were included in the campground’s base price, but often we would pay $ .50-.75 for a five-minute shower. Electricity was almost always an extra charge, and in Berlin it was metered. The facilities were generally very, very good and, even though it was high season, we aways found a place at our day’s chosen destination. We spent $954 on additional transportation costs. Two expensive Danish bridges and the Czech Republic’s autobahn tolls account for almost half of that. In addition, in several of the big cities we bought “Go” cards that allowed for unlimited travel on their buses, trams, and trains, as well as reduced or free admission to museums (public transportation is so well done in Europe). 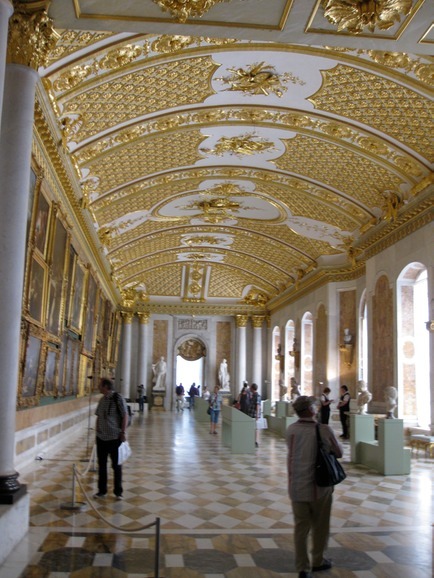 We spent an additional $690 on castles, palaces, museums and tours. Wifi was available in many of the campgrounds (and even free in some). Generally, the connection was slow or weak (or both), which made loading our blog a challenge. We paid $58 for connections. We also spent $2000 for food; the grocery choices were best in Sweden; the “dinkels” went into the garbage can after one taste. It was terribly disappointing to have to cut the trip short. We are still awaiting doctors’ opinions about Susan’s back. But we are enjoying AC in our condo. And we have some wonderful new memories of beautiful places and people: our happy, vigorous grandson and our adorable, creative granddaughter; the old lady in Copenhagen who put her head on Susan’s shoulder to hear her sing the lyrics to “The Old Rugged Cross” at an outdoor jazz festival; the young woman in a grocery store who Google-translated “sour cream” to be sure she was giving us the right product; the owner of a pickup truck--one of three we saw on the whole trip--who wanted to see Rover’s Ford V-10 engine because he fondly remembered driving one during his years in the States; the Swede who had lived in Texas and now runs a little fishing camp (but hates winter); the flight attendant who saw the tears on Susan’s face as we took off from Amsterdam and brought her tissues . . . The Prague Castle complex is the largest in Europe. And since it is all stone and cobble stone and no trees for shade, it was a very hot walk . . . but with beautiful views over the city. By the end of the day, when we had dinner with Jeremy and Amber, we had pretty much decided that we could not continue to do this. Tomorrow we will head for Amsterdam to put Rover in storage until who knows when. It was a relatively short drive from Dresden into the Czech Republic. Before we even left Germany we had to stop and put money on one of those little boxes (“vignettes”) that read tolls for the Czech Republic. And then we drove on into Prague. 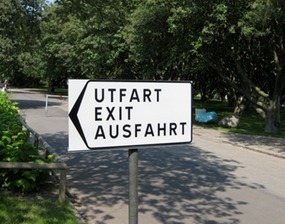 For the first time since Finland, we understood nothing on any of the road signs. We aimed for a small campground north and close to the city that had good transportation connections. When we arrived, we found there were actually five small campgrounds, side by side--basically a house with a steep driveway leading to the backyard. The one we knew about had such a narrow gate that we didn’t dare try it, but the fifth one looked safer so we pulled in there. The reception was closed, and when we looked over the fence to #4, we decided we liked the looks of that site better. So we left Rover and walked next door to check out the driveway and ask whether they had room; we then went back and moved Rover one yard over. The best part is that the electricity is enough to run the air conditioning. It’s 96 right now and getting hotter tomorrow. It’s pretty difficult to feel like doing anything in this heat, but tomorrow we meet our son in Prague and we won’t miss that. We had a long drive to Dresden, going around Berlin and Potsdam to head south. It was also a hot drive, but we were rewarded with a mostly shady spot and a pool in the Dresden campground. This is a fairly large place that fills up as the day goes on. But because we usually arrive at a campground early in the afternoon, we haven’t had any probems and have a choice of spots, even though we haven’t made any reservations this summer. 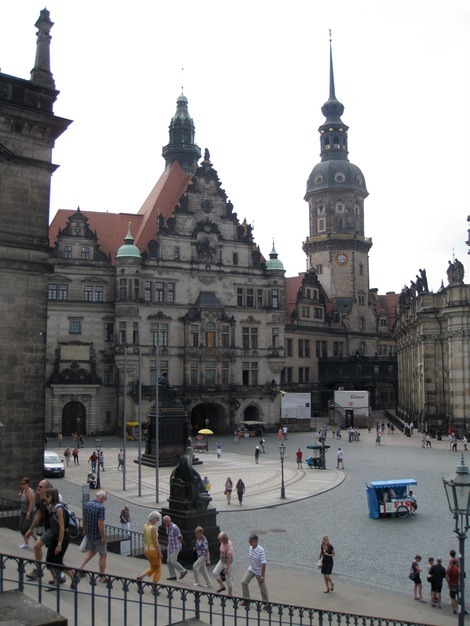 Dresden was pretty much leveled during the war, and many of the more important buildings have been rebuilt. One photo at a museum showed the rubble left after the bombing: it is amazing to think they could reconstruct many of these ornate buildings in their original style, even managing to use some of the original materials. Some parts have only been finished recently, while others are still barren, and much of the city center looks rather plain and new. We took an English language tour of the opulent Opera house, rebuilt in a new location after (you guessed it) a fire. We also visited several churches and museums and had dinner in a Mexican restaurant. And Dresden gets the prize for the best bus and tram system and maps. But the heat is something else. Our bus-ferry-train-bus trip from our Berlin campground to Potsdam served us well. We were standing in line at the Sansoucci Palace before the ticket office opened at 10 a.m. and were part of the third group allowed in. True German palace overload for one very warm day. But the bus-train-ferry-biergarten-bus return worked well, and since Rover’s campingplatz has been in the shade in the afternoon, she isn’t even to hot to return home to. We have been looking for Cheerios since we got to Germany. We had no trouble finding (a version of) them in Norway, Sweden and Denmark, but not, alas, in Germany. We finally found something that looked like fat ones--labeled ‘Saltoos’--which didn’t sound too healthy. It also had a little sign saying ‘100% Dinkels.’ David insists that “one can never have enough Dinkels,” so we bought some and will give it a try. Berlin is big. Buses, trams, subways and trains move people very efficiently, but not necessarily to tourist attractions. So we walked . . . a lot. On our first day we found four Starbucks. 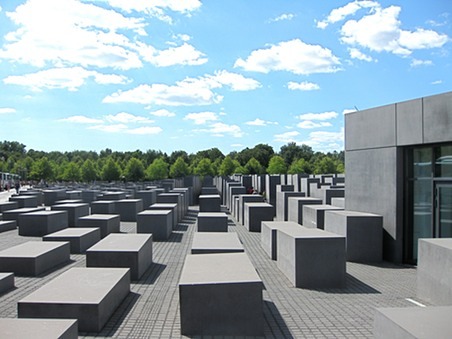 Over three days we stopped at Checkpoint Charlie and pieces of the Wall, walked through the Holocaust Monument and the Brandenburg Gate, visited three art museums and three churches, and learned the locations of lots of bus stops. Throughout the early 1900s, Germany had been part of a three-country archeological team that unearthed ancient cities in Iraq, and until the 1960s their finds were divided among the teams before Iraq put a stop to that. 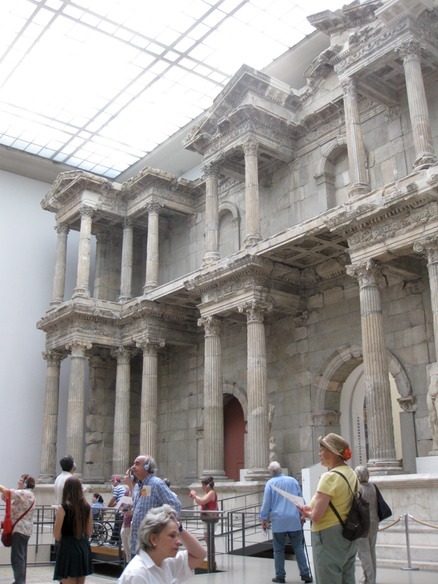 As a result, one of the museums we visited had huge permanent installations of stone temples from Babylon, Assyria, and the Roman city of Miletus. In another museum we added four more Monets to those we have seen; but at still another on our list, tickets were completely sold out for July. But our favorite museum, on our last trip into the city, was the DDR Museum, detailing life in East Germany while the Wall was still in place. It had everything: an interrogation room, a prison cell, a mass-produced apartment, a car, tv shows produced by the government, hundreds of items from everyday life for infants to adults, children’s balls shaped like hand grenades and evidence of a government struggling to provide for its trapped population with few resources to export to pay for it all. It was very well done, very popular and pretty awful. Potsdam was on our list of paces to visit and when Susan looked carefully at the map she realized our campground was closer to that city than to Berlin. Challenged, she looked for a bus going in that direction. What she found instead was a ferry that would take us from the little town four bus stops down the road, across the lake, to a train that would take us to Potsdam in 10 minutes. We tested this coming home from the city, thereby avoiding one of those eternal hot bus rides in favor of a fairly cool 20-minute train ride, an even cooler 15-minute ferry ride, another 20 minutes sitting in a biergarten . . . and a puny 5-minute bus ride back to the campground. On both ends of the ferry ride are little summer tourist towns. Why didn’t we learn this earlier? It was even all covered by our three-day bus ticket! Susan plans to rewrite the English “How to get into the city” sheet that was given to us when we arrived at the campground and leave it with the manager. Going into Rostock, we did something we rarely do: drive blindly into a city with nothing more than 1" of German country map. But Rostock had no campground within reasonable distance, so we decided to stop and look around and then head south. We drove on main streets, the GPS occasionally telling us “Don’t go there, you’re a truck!” when we tried to feed it addresses. But we found a “park and ride” lot with a broken payment machine, backed Rover’s rear end over the curb so we would be taking only one space, and took a tram 3 stops into the city. 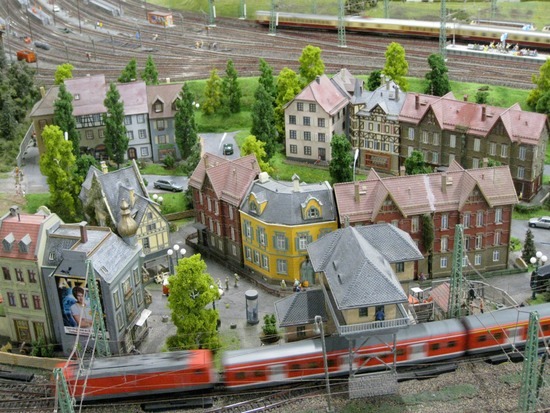 The German cities we’ve visited are just buzzing with activity, which we suspect is primarily generated by tourists. We stopped in at a church, of course: this one dated from the 13th century and survived the war intact. We arrived just as its astrological clock was chiming the hour. This clock, about 40 feet tall, was built in 1472 (that’s before Columbus sailed for America!) and still has all its original working parts. But we missed seeing the disciples marching around Jesus way up at the top: that only happens at noon and midnight. 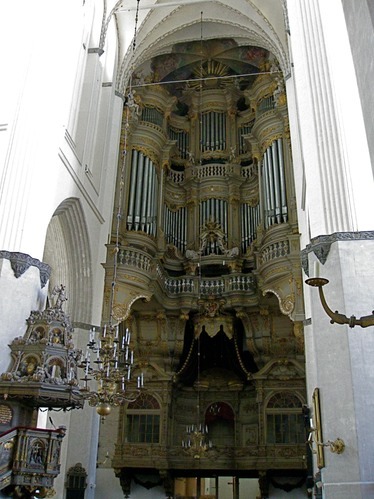 The other remarkable feature of this church was the massive organ--taller than the clock looking like layers of balconies in a theatre, each with hundreds of pipes. We drove another autobahn to Berlin. Germany’s A roads live up to their hype: cars do speed past, and there are warnings by the 85-mph speed limit signs that show one car rear-ending another. As we approached Berlin, the traffic in our direction again came to a dead stop and then crawled along for about 5 miles, once moving aside for an ambulance. We passed an accident on the other side of the road; behind it, the traffic was at a complete standstill for the next 12 miles. Approaching the Berlin campground, we followed the GPS when it wanted to take us a bit out of the way. The next day we found out why: the bus we took into the city picked us up outside the campground, and then about a half mile north the southbound lane was closed for about half a mile. This meant that on the way back that evening, our bus had to detour, go to the end of the route, and then come back to our stop. It had taken 40 minutes to get into the city but more than an hour to return . . . on a very hot bus. The GPS gave us a detour that everyone else seemed to be taking, so we abandoned the A in favor of city streets, inching along . . . to the world’s tightest campground: basically a driveway with about 15 spaces, each 12 feet wide, along each side. Somehow David managed to back Rover in, and we settled down with quiet neighbors on both sides. We were a long bus ride from Hamburg central city, and during our visit the bus and subway systems conspired to do us in. But we found a wonderful photographic exhibit by Steve McCurry of the National Geographic magazine, another magnificent church (this one the largest Protestant church in northern Germany) and then, to top it off, a massive miniature train display that went on for a block and a couple of floors in an old warehouse complex. It came complete with planes landing and taking off and night coming and going with all the buildings and vehicle lights coming on. One of the thousands of features was a rock concert attended by 20,000 tiny people. It had everything, and every tourist in town came to see it--some with their dogs. We found a little restaurant near our second chocolate factory before we took two subway trains and a bus back to our campsite. In the morning the campground manager pulled a post out of the ground to help us turn out of our spot and drive away. The posts were designed to do that, so we apparently aren’t the first 24’ vehicle they have had to accommodate. We faced some of the same traffic getting out of the city, and our GPS pulled a fast one on us in Lübeck: there was a detour right at our exit, and it chose to lead us in a very roundabout way to our very nice grassy campground. 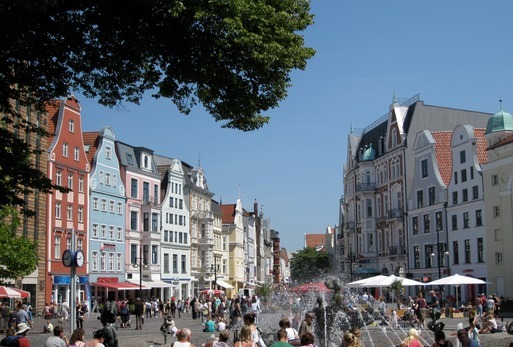 Like Hamburg, Lübeck is a mix of old and new side by side. So much of these cities were destroyed during the war that it is obvious what survived and what has been rebuilt. 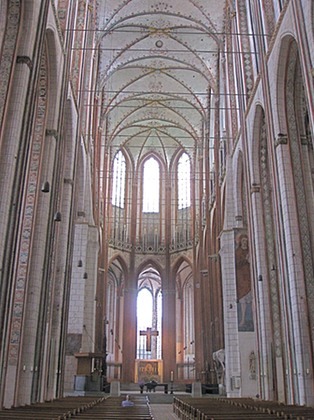 Lübeck’s 13th century Marienkirche, the third largest in Germany, has high vaulted ceilings and twin steeples that rise nearly 400 feet. The bell tower was among parts of the church that was destroyed during bombing in WWII, and when the church was rebuilt the bells were left, as a monument, where they had fallen. We are in what was East Germany. Little evidence of it remains, but as we left Lübeck we drove by a very new airport from which we had seen some fighter jets flying in formation. Nearby were several old concrete barrack-like buildings, and at our next campground a quonset hut was doing duty as a restaurant. We haven’t had rain since we left Sweden. Some farms in Denmark were irrigating their fields. But we are enjoying this beautiful weather and now that we are much further south we are also enjoying longer, darker nights. We’ve been doing some short mileage days with short trips into small cities and towns. Our first stop was at Roskilde, where a large campground overlooks a fjord. It was a lovely sloping spot, but the hedge behind us blocked our view. We were even brave enough to walk into the salt water, which wasn’t as cold as we had expected. This small city has a UNESCO World Heritage Site Domkirke (cathedral) where 37 Danish kings and queens are buried. 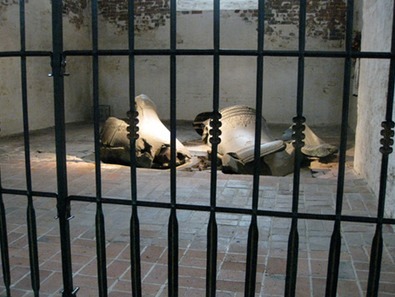 “Buried” may be misleading: they are not under the church’s floor or nearby, but in massive carved stone caskets in side chapels, each more ornate than the last. 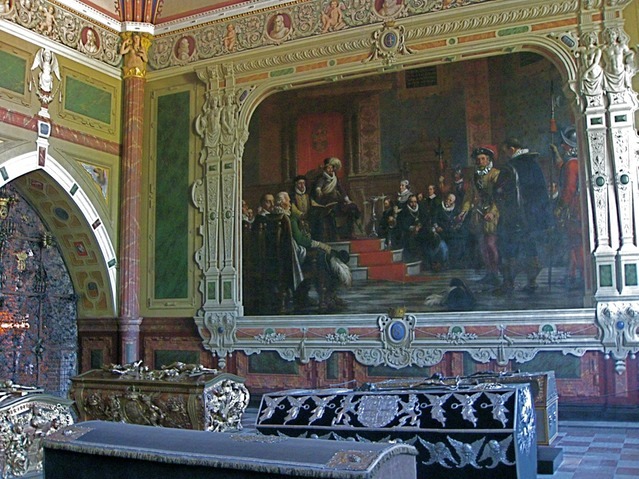 On one chapel’s walls were painted such exquisite murals of the monarch’s life you would swear their frames had been carved from stone. In fact, though, they were two-dimensional trompe l'oeil paintings. And a ghoulish touch: one of the chapels is currently being readied for the entombment of the present king and queen (there’s even a photo of the sarcophagus that’s been OKd). 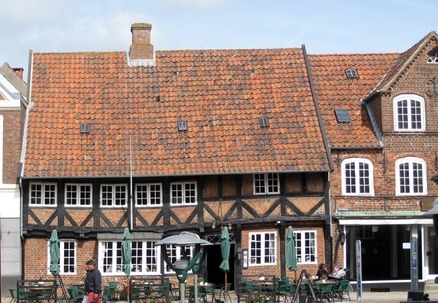 Roskilde’s second attraction was the Viking Ship Museum. We left the campground early so we could park Rover easily in their parking lot and waited for it to open. But as we were waiting in line to purchase $20 tickets (each! ), we looked over the rail into the open area below and saw all five ships. Centuries ago, they had been filled with rocks and scuttled in the harbor to prevent an invasion. 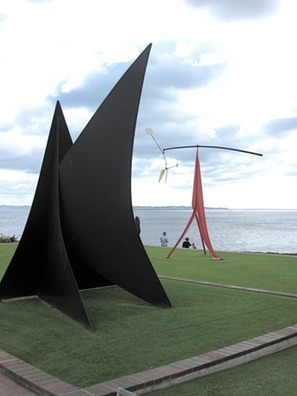 In 1962 some of the pieces were recovered and the ships reassembled. But only partially . . . and since we had seen bigger, better, and much more intact ships in Oslo, we decided to save our money and go on our way to Odense. 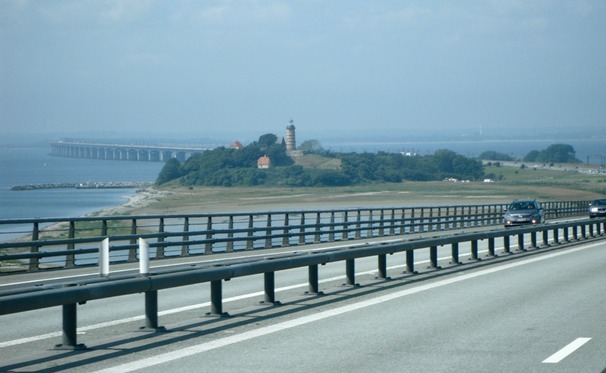 Odense is on the more western of Denmark’s two major islands and gave us the chance to navigate another 10-mile bridge (and to pay its$122 toll). The young man in the toll booth asked us how much Rover weighed. We answered him (but in lbs, not kgs, which he did not understand). He asked if we had our vehicle registration; when we told him it too would read “pounds,” he gave up, took our money and waved us on. We walked the streets of Odense’s old town, saw Hans Christian Anderson’s little birthplace . . . and not much else. 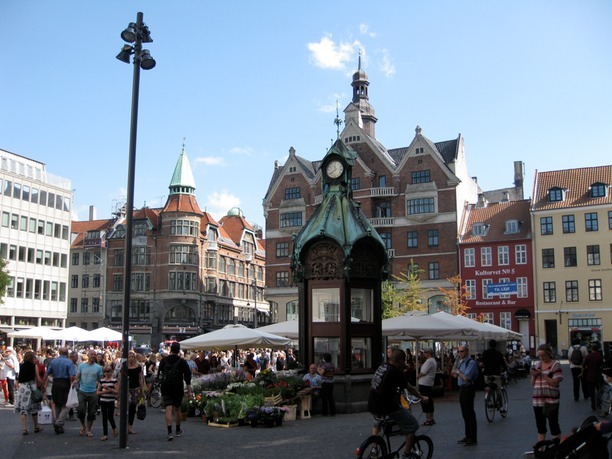 But if you want to purchase something “fairy tale,” Odense is the place to go. We got a little turned around trying to get to a gas station and toured a residential area. They obviously need a few more traffic circles. Gas: 44 gallons for $342, or $8.10/gal. Both here and at a gas station in Sweden the pump stopped automatically at 500 or 1000 kroner; this didn’t come anywhere close to filling Rover’s 55-gallon tank, so we had to reinsert our debit card (only once in Odense, but three times in Sweden). We drove on to Kolding, a town in Jutland, Denmark’s westernmost province. This bridge was a measly 5 miles, with no toll. We are now on Europe’s primary landmass, so we expect no more ferries or huge bridges. Kolding has a fortress (1268) turned castle (1400) that is unlike anything we have seen before. It was destroyed by fire in 1808, the heavy slate roof crashing down and destroying everything but the outer stone walls. 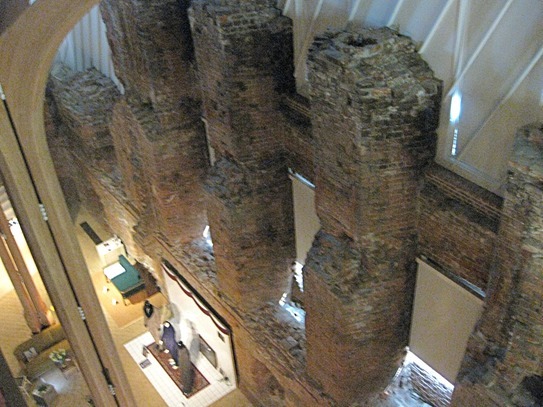 The “restoration” in the 1990s kept the exterior ruins intact and visible and supported the new floors with modern wood and metal structures that suggest the original interior structures. Each room is now a gallery for changing displays. It was quite a pleasant surprise. Then we ventured on to the Trapholt art gallery, which turned into a major bus ride, a long walk and a very long wait for the bus to return. The gallery was interesting, but they wouldn’t allow anyone to sit on the Danish designed chair collection. Maybe, just maybe, it was worth the travel hassle. 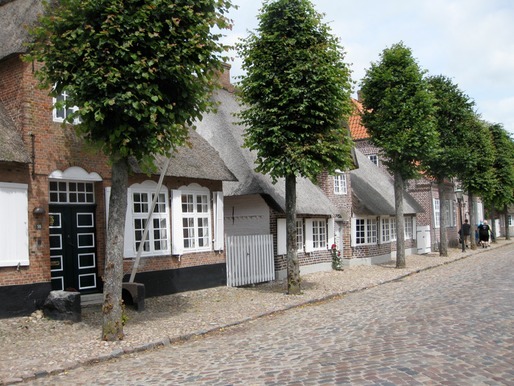 On Sunday we drove on to Ribe, the oldest town in Denmark. It deserves a photo album of its own. Some of the houses here are more than 300 years old. It was easy to walk the entire town in a couple of hours, and because it was Sunday--even in the high tourist season--many shops were closed. 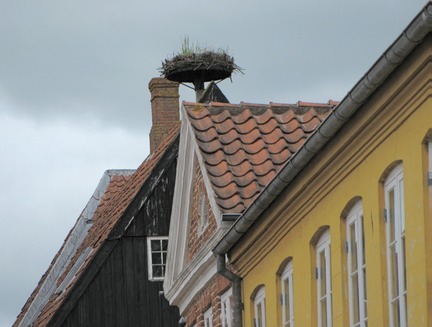 There were several large stork nests visible on the high chimneys in the town. We drove on to Mogeltorden, another old town about one street wide and just about the most romantic looking place you can imagine: 300-year-old houses, roses climbing everywhere, a cobblestone street where Rover wasn’t allowed. There were even fewer shops here--it’s just a lovely street of old houses, followed by a large church and a huge campground (with lousy wifi). These last few days of travel have followed a variety of patterns: sometimes we are in a campground for two or more nights; sometimes we arrive around noon and then explore the town; at other times we visit one or two towns before stopping for the night. There are plenty of campgrounds to choose from, so we don’t have to commit ourselves before we are ready to. Rover continues to perform well. We have chosen to shut off the incoming electricity a couple of times due to voltage drops in the campground’s power and to keep our inverter/charger from switching off and on. Best of all, Susan has less pain and David is keeping up with her (we just move a little more slowly than, say, five years ago). Tomorrow: Germany. 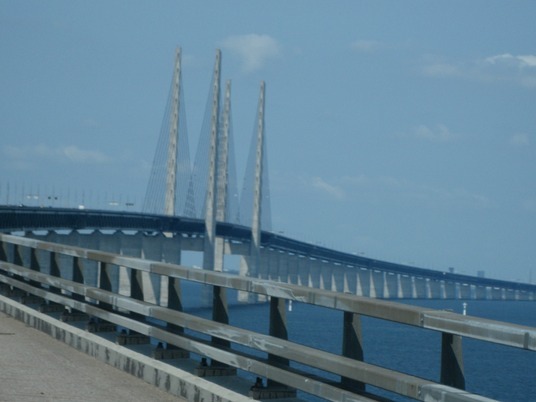 The Øresund bridge from Malmö, Sweden, to Copenhagen, Denmark, is a beautiful, wide, seven-mile, four-lane bridge with such wide shoulders we hardly knew we were on a bridge. And then after about 10 km you descend into a tunnel three miles long before arriving in Denmark. Charge for the thrill: $118, if your RV is longer than six meters. Rover is. On our way to our first Danish campground we stopped at a grocery store. Since we had only Swedish kroner in our pockets, we cautiously asked whether they took Swedish money before we put anything in our cart. ‘Yes,’ said the young man at the counter, so we proceeded to fill our basket, but just as we arrived at the checkout counter, he left. Confusion...low-level Scandinavian impatience. It took a manager, lots of key punching, and even more time--holding up everyone behind us--before we got out of the store. A helpful woman (who earlier had helped us chose detergent and gum and got stuck behind us at the checkout) pointed us in the direction of a large shopping center, where we were able to find an ATM and stock up on Danish kroner. to frightened tourists who’d thought it would be a good idea to rent one . . . and almost none of them wearing a helmet. 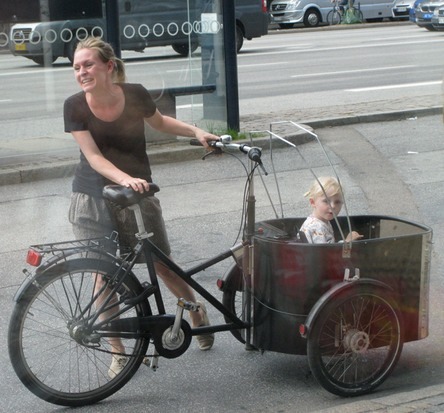 You quickly learned not to just step out from a sidewalk or onto a bus without looking up and down the bike lane. When we did raise our eyes from traffic hazards, we noticed how beautiful Copenhagen is: canals crowded with houseboats and yachts; spires on once-important buildings everywhere you looked; miles of four- and five-story stone buildings, built before elevators were invented, with ornately carved facades; large open squares, each with its own statue and pigeons; and, of course, palaces. And through all of it swarmed tourists, buses, and bicycles. 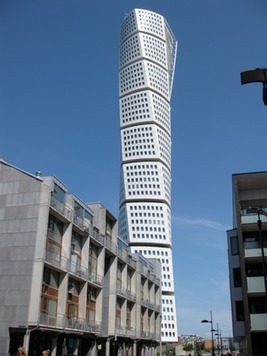 After the cool rainy weather in Norway and Sweden, Copenhagen was hot under the bright sun in the clear blue sky. We started our touring on Monday, when most of the museums were closed. According to Susan’s pedometer, we racked up 14,000 steps (about seven miles), walking the pedestrian shopping streets, visiting Danish design studios and churches, and taking a canal tour to rest. On Tuesday (18,000 steps) we visited no fewer than five museums, one of which featured a huge Degas exhibit that, because it took over the museum’s entire ‘French’ section, prevented Susan from adding one more Monet to those she has seen in person. Another one we visited--this one particularly difficult to find--was a theatre museum in one of the city’s many royal palaces, dating from 1767 and refurbished in the 1800s. Visitors could walk all around the auditorium, onto the stage, among the costume displays, and even into the king’s own box. That evening we ate dinner in Tivoli, the full city block of amusement park, restaurants, and gardens right in the city center. Because we had stayed longer in the city that evening, we came back on a later train, only to find we’d missed the last bus to our station. Instead we had to take a different bus to a different station, then take another train two stops to our station, and then, of course, walk back to the campground. We might have considered staying another day but the long trip into the city, combined with the heat and humidity, proved to be just a little too much for us. 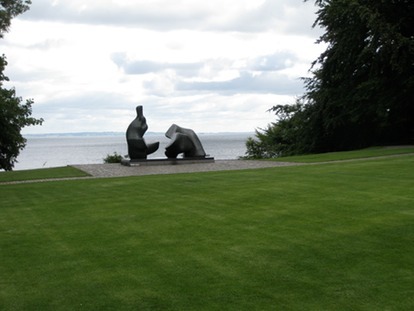 So on Wednesday we drove around Copenhagen on a ring road and headed north 34 miles to “Louisiana,” a modern art gallery on a beautiful spot with gorgeous trees and gardens overlooking the Kattegatt. We stopped at a nearby family-run campground and just relaxed for the rest of the day. The weather has turned cool and very windy, and either Rover doesn’t like our electrical connection or the campground doesn’t like our power demands. Whichever is the case, we’re registering less than 110 volts and have tripped one of their circuit breakers. 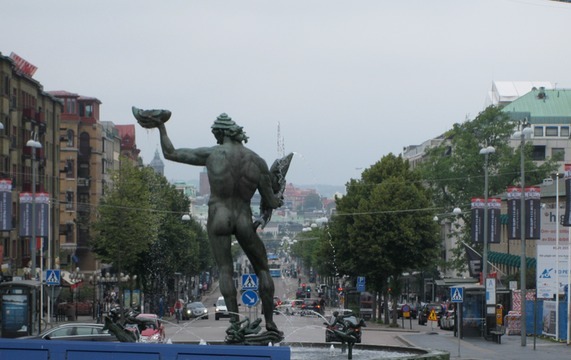 Gothenburg (Göteborg), Sweden, proved to be a lively city, even in the rain. The crowded campground was also a little too lively for our liking, but the facilities were excellent--even if you did have to punch the shower faucet every 15 seconds to keep the water flowing. The wifi? . . . not so good. The notice in the office saying that there was trouble with the wifi throughout the site was computer printed and framed: a sure sign that it was a problem of longstanding, and one they had no intention of fixing. The tram to the city was quick, the bus and tram maps unintelligible, but we managed to find our way for two days to museums, galleries, old parts of town, a Starbucks, a massive shopping center that went on for blocks, and a river and harbor cruise that necessitated crouching on the floor so we would not be decapitated by a very low bridge. We drove on to Malmö, still barely in Sweden, stopping along the way for our first gas fill up: $8.20/gallon. The campground here is large and full, and once again we got the last spot with electricity. We can see the Kattegatt (a finger of the North Sea between Sweden and Denmark) from our rear window. We are parked on grass in a large marked site, surrounded by Jehovah’s Witnesses. There must be some sort of denominational gathering in the city, as we see many, many people here wearing name tags and dressed up when they return in the late afternoon (and, unlike other large groups in European campgrounds, they are blessedly quiet at night). They never knocked on our door. This campground was purchased by new owners a few years ago, and improvements are obvious. When we tried to take a shower there was only cold water. When we told them at checkout that we didn’t want to pay for the showers they apologized and said they had a big problem and gave us cookies to take with us. We used their very accessible dump station and then refilled with water before we left for Copenhagen over the Öresund bridge (which we can also see from the campground). We expect to pay a very high toll. Malmö was a surprise: fairly new looking, well kept, with roses everywhere. The chocolate factory was closed, but the shop wasn’t, so they sold us chocolate anyway. We hopped from bus to bus, and when Susan lost her bus pass the last four drivers let her on anyway. 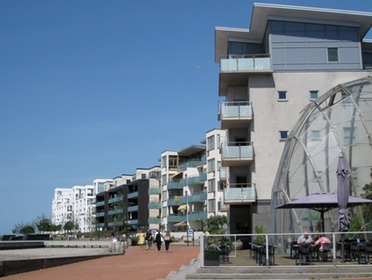 The harbor by the Turning Torso (the tallest building in Sweden) was a delight with all its different apartment buildings, walking streets, and street art all the way to the water. The city has been renewed by the opening of the bridge to Denmark and a new university. It was all the more enjoyable because of the clear blue sky and bright sunshine all day long. We are reminded of how little Norwegian and Swedish we had learned and forgotten from our first European trip 40+ years ago. But no matter: virtually everyone we have encountered speaks English. The translations can be a bit strange, however. One sign at a campground read “This door must be closed when it is locked.” Then we saw a shop called “Doctor Fish Beauty.” And there are “farts” everywhere: Farts Damper, Sjofartsmuseet, Farthinder. We fit right in. We headed south to the Oslo Campgound we have stayed at twice before. We arrived around 3:30 p.m. and found what may have been the last available electrical outlet. There have been no noticeable improvements to this place in the past year, and they are sorely needed. But the ease and speed of getting into the city center is what wins us over. It rained every day we were in Norway--sometimes all day--and Oslo was no different. We got caught in a downpour running from the subway to the Munch Museum’s celebration of the 150-year anniversary of the birth of Edvard Munch (he of ‘The Scream’). 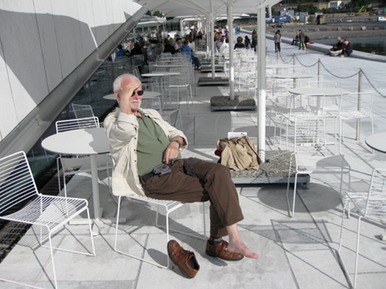 Later in the day David sat for an hour at the spectacular Opera House drying his shoe and sock in the surprising sunlight while we waited for a dance performance to begin. All the dancers, with the exception of a single young girl, were 65 to 78 years old. It was a bit weird, unimaginative, and somewhat sad . . . and it was over by 7:30. We guessed that all the dancers had to get home to bed. So we did, too. Then we drove south to Fredrikstad, the best preserved old city in Scandinavia. It consists mostly of old military buildings converted into commercial establishments and museums, well restored, situated on the river with cannons facing out to keep the Swedes from invading (which they did anyway). Because we were tired from walking about on the cobbled streets, we decided to stay at the campgound just outside the gate, but they turned us away saying the ground was too wet at the few remaining empty sites. With no other option nearby, we got back on the E6 highway and headed farther south to a little fishing camp. It was a lovely spot if you looked out over the swans on the little fjord. The E6 bridge was high above our heads. The happy and very large Swede who ran the place didn’t bother to take our names--our money was enough. He told us he had lived in Houston for a couple of years and didn’t like the winters in Sweden! We were one of four RVs that stopped overnight to join the dozen or so permanent residents in cabins. The first thing we did the next morning was stop at the first shopping center outside of Norway to buy quite a few groceries, a pair of shoes for David, and--we finally found them--a bag of little mini-Snickers candy bars. We stopped for the night in Gothenburg, Sweden, a large city best known in the US as the home of Volvo. We were aiming for a campground whose write-up in the book promised easy bus service to the center, but when we finally found it (with good signage from the highway) it was closed. The GPS found us another, but that one proved to have very poor connection to the city. However, the young blonde man at the counter found us the last spot in another campground, this one on a tram line. So we backtracked 10 miles through city rush hour traffic to that one--it is a large place where we are jammed in on hard standing with little grass in between sites. July is the “everyone goes on vacation at the same time” month, so we may have to start phoning ahead to make reservations. (Hint: Mobel sells phones with universal SIM cards that don’t need changing whenever you cross a national border--and they’re British phone numbers, so the cost is less than it might be). We have been drinking the water and haven’t gotten sick yet, so we think the plumbing lines are clean and clear. Susan has experienced a whole new sharp pain in her right hip that feels independent of the bulging disk problems, but keeps going anyway. David is managing the shortness of breath well, so long as we keep a slower pace. We did 10,000 steps in Oslo on Saturday and 8700 in Gothenburg on Wednesday. Maybe we can do this after all. Our travels have been delayed this year by health concerns for both if us. So finally, armed with a bag full of pain meds, we boarded the plane for Oslo and survived the trip with relative ease. Rover was waiting for us in our daughter’s yard. Our son-in-law had picked her up for us since the storage owner was leaving for the typical month-long “everyone goes on vacation at the same time;” Rover is in great shape--everything functioning and ready to go. Now if we can get all of our functions going, we will be heading south. It is obvious to us that one of the things we will learn soon is whether we can actually continue to do this kind of travel. One of the concerns we were left with last fall was the mystery fluid the plumber in Lillehammer had given us to use for antifreeze. When we flushed out the system a few days ago, the water had turned blue and fizzed and bubbled and smelled heavily of alcohol. It took much flushing to get it to normal. While staying with our daughter and her family, we have been using only water from the house for drinking, but when we leave for Oslo tomorrow we will begin using the water in Rover’s tanks. We don’t think we can get much sicker anyhow. 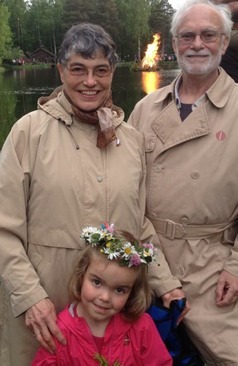 We have been in Lillehammer enjoying our grandchildren, playing with Rover, and celebrating the summer solstice at the community's traditional bonfire.We are once again reminded of just how expensive things are here. We bought four ice creams (the prepackaged cone kind): $16. We filled our daughter’s car with gas: $107 (about 8.70/gal). And tonight we went out for pizza--one large, one medium, one child’s and one beer--$125. We will postpone buying groceries until we get to Sweden.